The Ford Escape is among the huge flock of crossover SUVs that now dominate the industry. 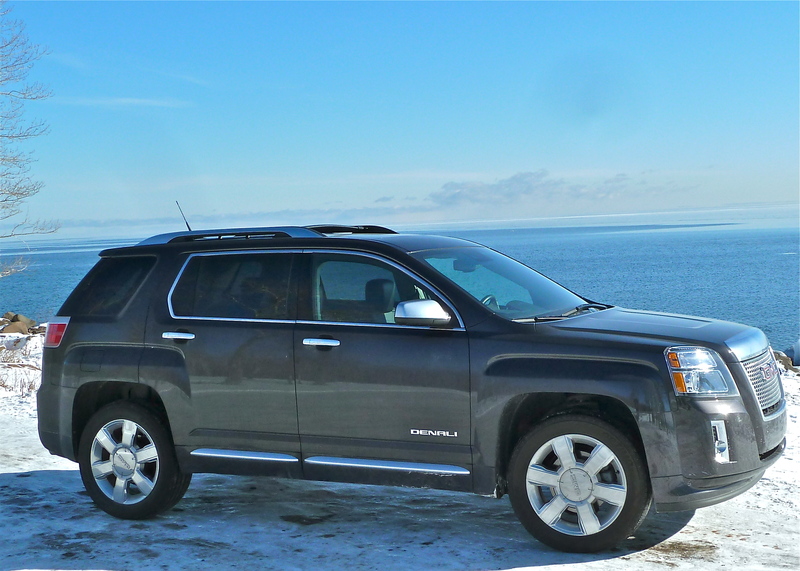 Can a big, spacious Tahoe or Suburban be effectively replaced by a Terrain, or an Encore? Can an Expedition or Explorer be effectively reduced in size to an Edge, or maybe an Escape? And how about Mazda, which celebrated when the full-sized CX-9 won North American Truck of the Year honors three years ago — can its tasks now be entrusted to the CX-5? If you haven’t noticed, the players have been multiplying and shrinking at the same time, and at a record rate, and if you can’t tell the players without a program, examine the decreasing numbers. The X5 led to the X3, and now to the X1; the XC-90 is joined by the XC-60; the LR-3 now is joined by the LR-2; the highly successful Encore gave Buick a luxurious and popular vehicle and for an encore, it quickly created a diminutive cousin, the aforementioned Encore; and a decade after Toyota added a third-row seat and V6 power to enlarge the RAV4, it brought out a new RAV4 — smaller, and without the third row and V6. Detroit automakers ran into serious financial problems a few years ago, partially because of a three-way collision at their economic intersection of dependence on high-profit but gas-guzzling large Sport Utility Vehicles, which ran into a faltering economy, right at the point of unprecedented rising gasoline prices. Government bailouts, discontinued models, and an entirely different way that consumers and auto-makers saw their business were the result, and it hasn’t abated. Large SUVs plummeted in popularity, as buyers switched to smaller SUVs, which were called crossovers because they did the work of compact trucks, but were built on smaller car platforms, making them lighter, more agile, and more fuel-efficient. Maybe the kids had grown and left home, reducing the need for a large-family hauler, or maybe frighteningly low fuel economy figures pinched the budget, but downsizing made sense for a lot of reasons. A decade ago, there were only about a half-dozen compact SUVs, but as virtually every manufacturer tries to outdo the competition with better and more compact small SUVs, now there are over 60, counting a few crossover-crossovers, with more coming out every year. 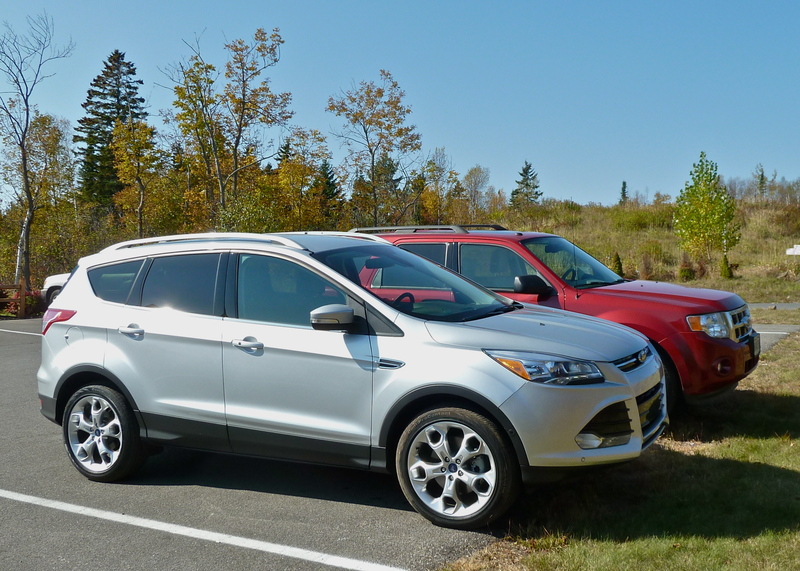 The popularity of crossover SUVs has also created a couple new segments of buyers. Large and midsize car customers are moving down as their kids depart, while some subcompact and compact buyers move up as their families grow. Both groups find that crossover SUVs house occupants and gear comfortably, and have joined the large-SUV buyers in downsizing to crossovers, pleased with sticker prices and fuel economy numbers that used to be the haven of only economy cars. Here, then, are just a few of the new-breed of crossovers. Surely there will be more to come. GMC Terrain looks trucklike but is short and compact. Perfect for buyers, as well as manufacturers, who feel the need to approach downsizing gradually, the Terrain is GMC’s version of the Chevrolet Equinox, but it definitely has more of a truck-like appearance. While shorter than the larger truck-based GM SUVs, it seems GMC felt the need to make the Terrain still look like a truck, albeit a truck with quicker reactions on its stubbier 185.3-inch length. As the new kid the Terrain is more versatile than the slightly larger and older Acadia, which, while similar in concept with front-wheel-drive/all-wheel-drive layout, comes only with the 3.6-liter V6, while the Terrain offers a base 2.4-liter with 182 horsepower, and adds the option of the rejuvenated 3.6 V6 with its 301 horsepower and 272 foot-pounds of trorque, and a 1,500-3,500-pound towing capacity and a 1,200-pound payload. Fuel economy shows 17 city 24 highway for the V6, with 20-29 for the AWD four.Together, the Acadia and Terrain combine for 30 percent of all GMC sales. New for 2013, the Terrain adds a high-end Denali version, loading up on luxury features. A lowered step-in and height, still leaves room for room for seven or eight passengers, depending putting three in the second row. Soft-touch dashboard material, with aluminum and wood, or wood-like, trim, the Denali has satin chrome and a real wood steering wheel. A 7-inch color touch screen is reconfigurable for Bluetooth, smartphone, voice recognition, and USB connectivity. Side and rear alerts, and a forward collision alert, plus lane departure warning and rear park assist are among features, and rear seat entertainment should ease any kids-on-trips issues. The test-drive Terrain Denali showed a quite-loaded sticker of $36,275 with the 4, and $40,425 with Denali trim packages that include cargo, trailering and navigation. 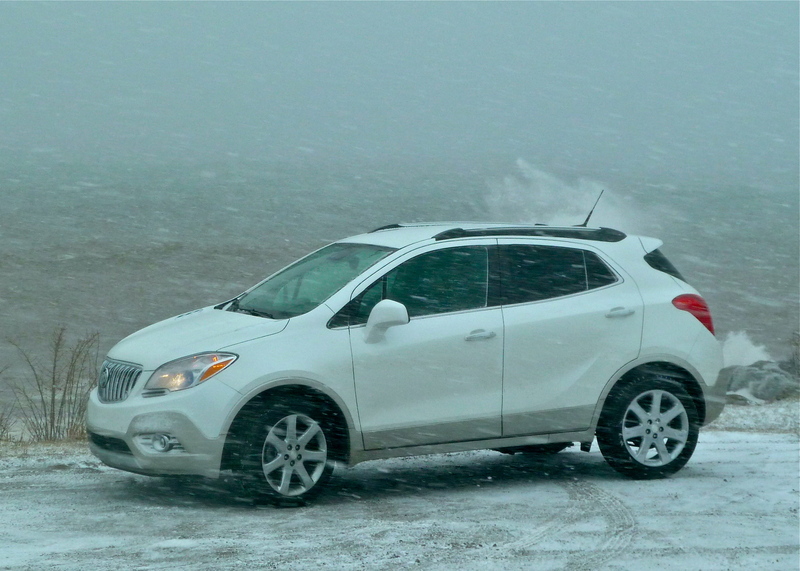 Buick Encore is a stylish smaller version of the Enclave. The Enclave has been such a huge hit for Buick that it makes sense to build a mini-Enclave, and the Encore pretty much fills that bill. Buick has done well in GM’s restructuring, and it is more of a global offering, with an engine first designed in Germany in a vehicle built in Korea, with its content 51 percent from Korea and 18 percent from China. Buick builds the comparatively small 1.4-liter 4-cylinder in the U.S., and it’s turbocharged to develop 140 horsepower and 148 foot-pounds of torque — more than adequate to power the smallest of all GM SUVs at 168.5 inches in length. It has dashing good looks and a lot of premium features, typical of Buick, and its front-drive platform works well with an Active on Demand all-wheel-drive system that uses a magnetic charge to engage a clutch at the rear axle when stopped to assure that you get some rear-drive push on start-up. Fuel economy has an EPA estimated 23 city and 30 highway, and compared to the larger and more luxurious Enclave, the Encore is quick-reacting and fun to drive as a 5-passenger vehicle. Bose active noise cancellation technology helps make the interior quieter, and the voice-activated IntelliLink on the full-color display gives it a luxury refinement. At a base price of $29,690, the loaded Encore Premium stands at $32,975 and includes 18-inch chrome wheels, navigation with the upgraded audio system are included as options.Front and rear Ultrasonic parking assist, the 7-inch screen with all its input jacks, remote steering wheel controls, rain-sensing wipers, heated leather seats, lane departure warning, Bluetooth, Bose premium audio, heated steering wheel, foglights, roof rack and remote starter system are all on the lengthy list of standard equipment. Honda CR-V is renewed to hold sales pinnacle. 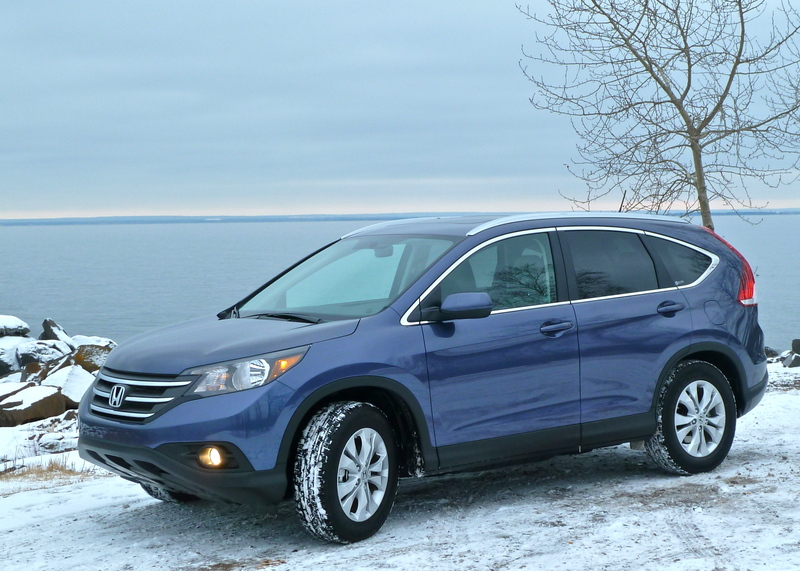 The acknowledged standard-bearer of the crossover SUV trend, Honda’s CR-V was totally redesigned for 2012 and retains its popularity with slight revisions for 2013. The high-tech 2.4-liter 4-cylinder now makes 185 horsepower and 163 foot-pounds of torque with a 5-speed automatic transmission as the only drivetrain. It works smoothly and efficiently, and adds AWD as an available option to the standard front-wheel drive. The system works well, with power going to the front wheels unless the computer detects the threat of slippage, when it apportions power to both axles. The exterior makeover makes the CR-V far more fashionable with a bold grille and stylish rear treatment. Electric power steering, stability control and brake assist completes an impressive safety resume, and interior features on the EX-L include leather seats, navigation with voice recognition and rear camera. The audio system upgrade has seven speakers with a subwoofer, and all the information connectivity features. Driver’s seat is 10-way power, and an EX feature to read and respond to text messages through the audio connectivity is a nice touch. Foglights and a large sunroof also are nice touches on the EX, which is the top of the line and has a sticker of $31,025 in the L (for Leather) upgrade. Fuel economy remains a mainstay with EPA numbers of 22 city and 30 highway. Redesigned Escape leaves predecessors behind..
For over a decade, Ford built its Escape into a stronghold as a spinoff of the Mazda Tribute design, but for 2013, the Escape jumps into its own new skin, with a high-style wedge front and neatly done rear in all-new package that lets the Escape rival larger SUVs, and outdoes many of them with technology. For example, Ford decided to go with fewer cylinders to gain fuel efficiency, and turbocharge the smaller engines if more power was desired — a feature called EcoBoost that runs throughout Ford products. In the Escape, the base engine is a 2.5-liter 4-cylinder with 168 horsepower and 170 foot-pounds of torque, running through a 6-speed automatic in either front or all-wheel drive. As the top option, a 2.0-liter EcoBoost 4 is turbocharged uyp to 240 horses and 270 foot-pounds of torque, lifting the Escape into the realm of 3,500-pound towing capability. Possibly the best compromise is a 1.6-liter 4 EcoBoost, which uses turbocharging to go beyond the 2.5 power with 178 horsepower and 184 foot-pounds of torque — a definite edge in power over the CR-V, for example. The turbocharging doesn’t hurt fuel economy, if you keep your foot away from power-surges, and EPA numbers go from the low to mid-20s to over 30 mpg. 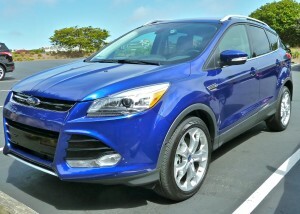 With Base S, SE, SEL, and top-line Titanium models, the price can rise from $23,295 to $35,630 for the Escape, which measures 178.1 inches in length. Even the base model is well equipped, with a variety of nav screens and design touches. Ford’s SYNC connectivity with voice-activated controls for phone and entertainment start in the SE and available features move up by model. Ford’s new-wave of technology includes Sony audio, premium leather seats, remote start, rear seat recline, ambient lighting, a power liftgate, and a brilliant bag-carrying feature, which is that when you approach the rear of a locked Escape, if you have the key fob on your person, you can wave one foot under the rear bumper and the hatch will spring open. Very handy. Kia’s popular Sorento is bargain midsize SUV. Somewhat subtlely, the Kia Sorento carved itself a nice niche in the midsize SUV bracket, outdistancing partner Hyundai’s Santa Fe. Both companies have companion smaller crossovers — Hyundai the Tucson and Kia the Sportage — but for 2014 both companies have completely redone their larger crossovers. The Hyundai Santa Fe now comes in long form or, as the Sport, in two-row form, both with catchy styling. It’s made in the Montgomery, Ala., plant. But 100 miles up into Georgia, Kia’s newly restyled Sorento is built in West Point, Ga., and it shows no indication of losing popularity. In fact, with a base 2.4-liter 4-cylinder pumped up to 191 horsepower and 181 foot-pounds of torque by using the direct-injection version, performance is improved by 16 horses. The V6 also is upgraded, dropping from 3.5 to 3.3 liters, but gaining in sophistication with direct injection, to 290 horsepower and 252 foot-pounds of torque. Both use a high-tech and smooth-shifting 6-speed automatic transmission. Fuel economy can reach EPA estimated 32 mpg, and while the V6 drops a bit in fuel economy, it takes the towing capacity up to 3,500 pounds for those hauling a boat or camp trailer. The smaller SUVs perform well, but the 184.6-inch-long Sorento offers an optional third-row seat for family hauling more kids or separating those already present. 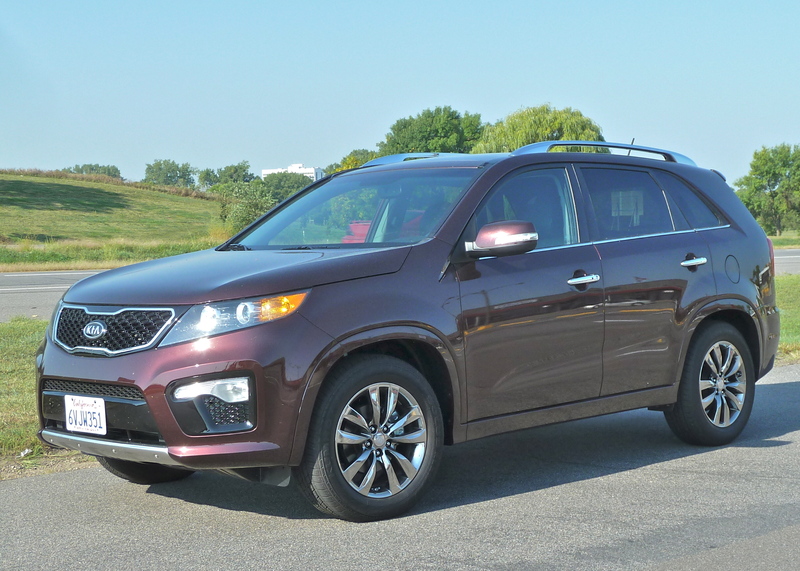 What makes the Sorento a major bargain is that it starts in the mid-$20,000 range, barely more than the Sportage, and if you option it up and over $30,000 to the $35,000 range, you can add some major features, such as a panoramic sunroof, air-cooled driver seat, navigation, upgraded trim. 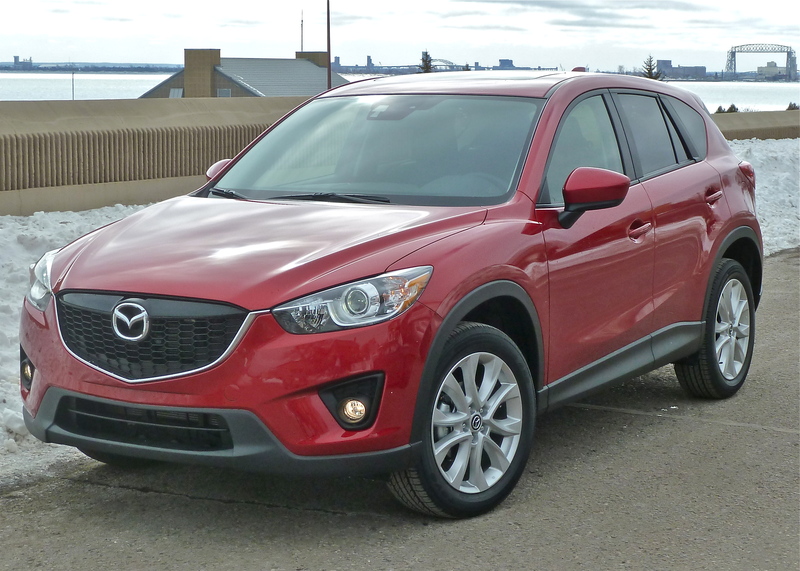 Mazda CX-5 has holistic Skyactiv technology. There are new crossovers, and then there are NEW crossovers. 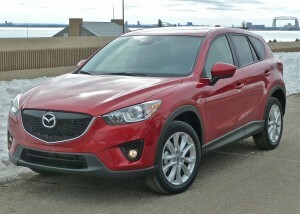 The CX-5 came out for 2013 as a vehicle much smaller than the CX-9, and shorter than the CX-7, but its overall design gave it more interior room than the CX-7, which it ultimately will replace. The design is just part of the package that Mazda calls Skyactiv. It includes all the aerodynamics and strong but light body parts, and mostly it included Mazda’s new Skyactiv 2.0-liter 4-cylinder with a totally new concept of smaller bore/longer stroke/direct-injection and Miller stroke valve timing, plus new in-house built 6 speeds, both stick and automatic. The drivetrain was first tried in the Mazda3 compact, with part of the manifold chopped off to allow it to fit, and it delivered 40 miles per gallon with improved power. The CX-5, on the other hand, was built from the start to house the whole engine and manifold, and it came away with a 13-1 compression ratio and still burns regular fuel. Some critics complained about a lack of take-off pep in the 155-horsepower, 150 foot-pounds of torque engine, but the wide-ratio gears were purposely built for fuel economy, not drag-racing. Once under way, with the revs up, a CX-5 is about 3 seconds a lap faster than the Mazda3 Skyactiv for a hot lap around Mazda Speedway at Laguna Seca, and it will get in the mid to high 30s for highway mpg. The CX-5, built light, lean and strong with an abundance of high-grade steel, finished a close second out of the box to the Ram 1500 in North American Truck of the Year voting. For 2014, Mazda addressed its critics by adding an optional 2.5-liter Skyactiv 4, built for the new Mazda6 sedan. and with 164 horses and 185 foot-pounds of torque, it satisfies the most power-crazed crossover buyer, even though the gas mileage dips to 24 city and 30 highway from 26/35. With its slick styling, roomy interior and high-class interior features, plus all the latest connectivity, the CX-5 goes to the head of the class among crossovers at a price range of $22,000 for front-wheel drive and $31,000 for a loaded Grand Touring model with the Tech package. Having to choose between 30 mpg and more potent power, or 35 mpg and adequate power, makes worthy alternatives for your high-tech crossover. Do you have a spam issue on this site; I also am a blogger, and I was wanting to know your situation; we have created some nice methods and we are looking to swap solutions with others, why not shoot me an email if interested. Quality articles or reviews are important to invite the viewers to pay a quick visit the website, that’s what this web page is providing. they are going to take benefit as a result I am certain. Hi, I read your new stuff on a regular basis. Your humoristic style is awesome, keep doing what you’re doing!